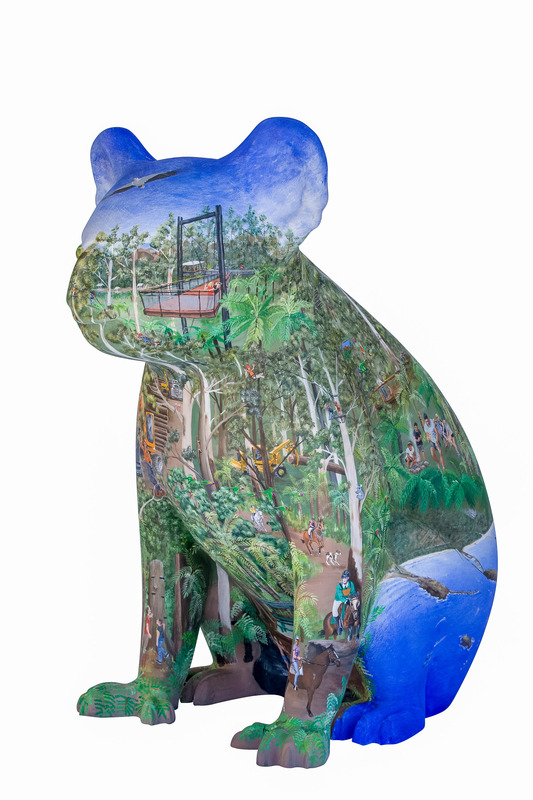 Woody Koala has been created to display the essence of the Forestry Corporation of NSW - Coffs Harbour. 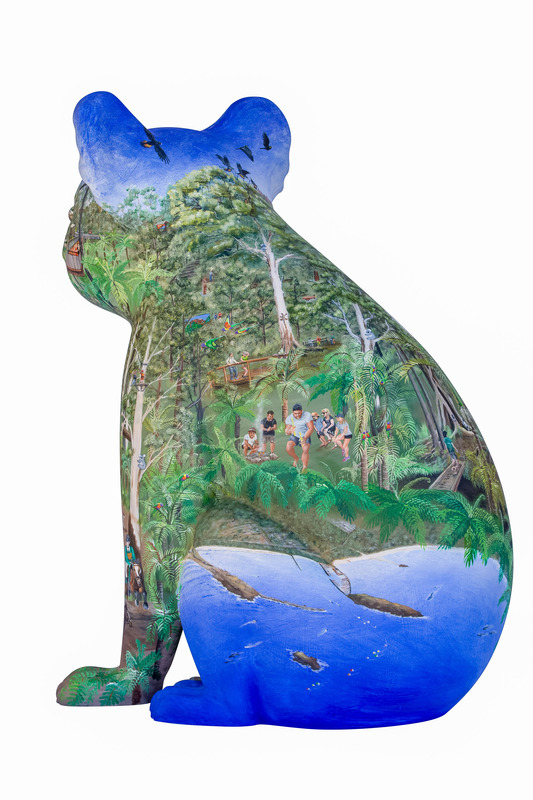 The images painted on “Woody Koala” take you from the crystal-clear Sapphire waters of the Coffs Harbour Shoreline, abundant in marine life and the yearly Humped back whales migration. Ascend to Coffs Harbours Famous Sky Pier at Sealy Lookout and picnic area, from here you survey the Coffs Coast, nearby is the adrenalin rush of the Adventure Sky Park, adjacent you can wander down the Gumgali Track with its featured sculptures and paintings, for a view from the Korora Lookout, stop a while and join a cultural tour and listen to the story in Gumbaynggirr language at the sound bar that tells the Gumbaynggirr story of Gumgali, the Black Goanna. The Forestry Corporation works closely with the Indigenous elders, and the cultural fire ceremony has become a very important event. 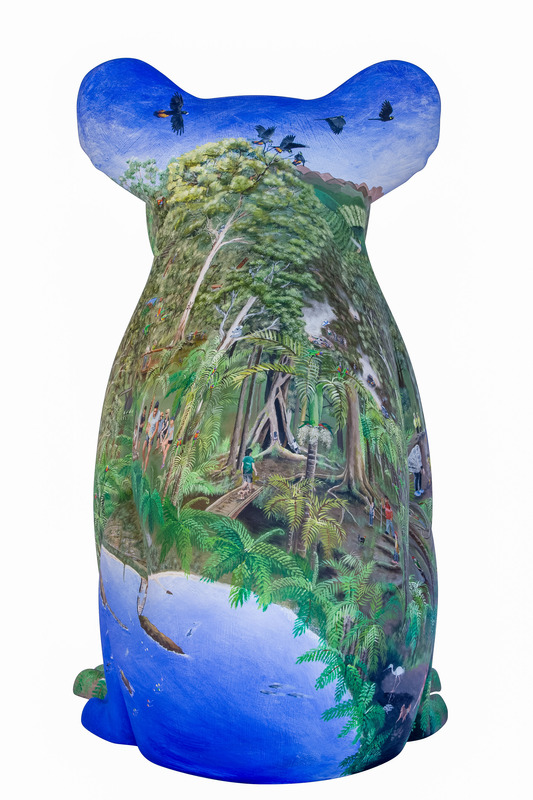 There are many walking tracks like the Garraangurr Track and the Rainforest Loop Track, offering a different scenery and eco system, palms and twisting strangler figs, lush with birdlife, the tropical flora and fauna is a photographer’s paradise and worth wandering through, the creeks were made for swimming and forestry corporation encourages you to bring your 4 footed mates or take a leisurely ride/drive on the many forestry roads on horses, mountain bikes, motor bikes or 4WD. A highlight on the forestry roads is when the World Car Rally takes flight, the dust rises and the engines roar in November each year. This Forestry Corporation sponsored event welcomes excited crowds to set up in vantage points scattered throughout their lush regrowth forests. Woody was a celebrity guest at the 2017 World Car Rally and enjoyed being photographed with the winners. The highest peak in the Coffs Harbour Hinterland, Mt Coramba and Radio tower, plays host to regular a Downhill mountain bike-dash. 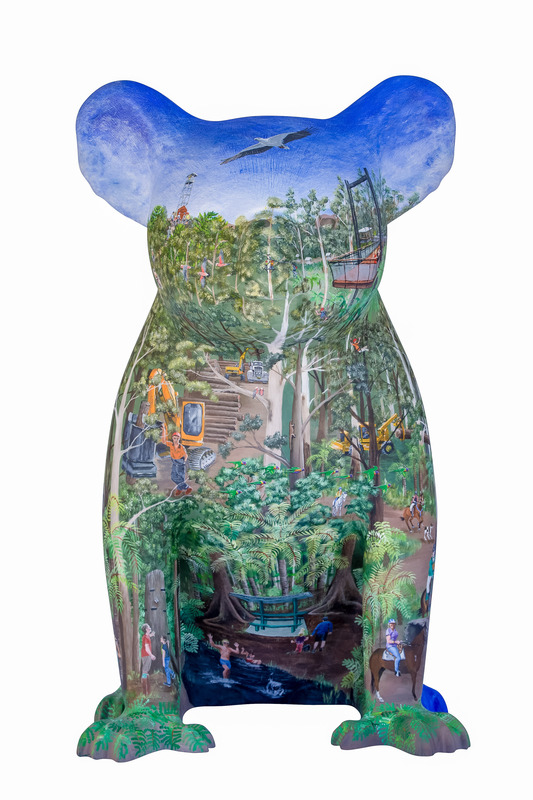 Forestry Corporation creates and maintains many opportunities for the community to be a part of the Australian bush. Behind the scenes is the lifeblood of the Forestry Corporation, the timber workers, with examples of their selective harvesting methods. I hope you enjoy Woody as much as I have enjoyed creating him. 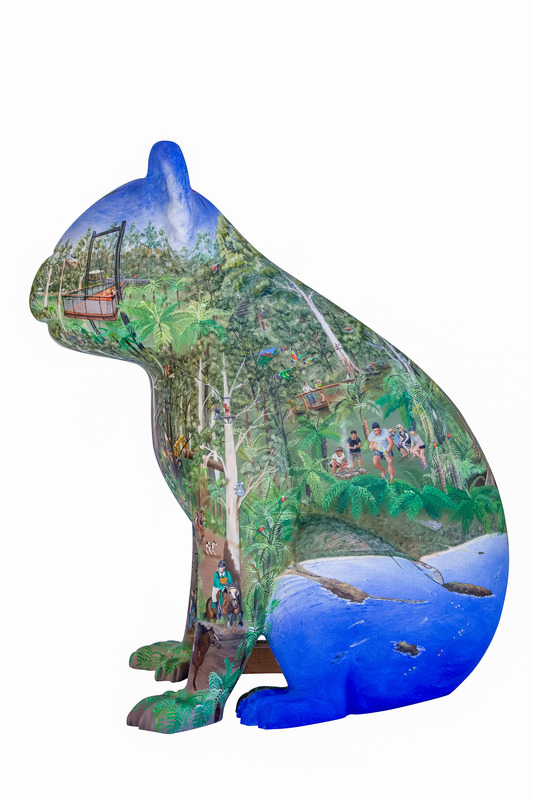 Woody Koala has been created to display the essence of the Forestry Corporation of NSW. Every painting is individual, placing the viewer within that scene. 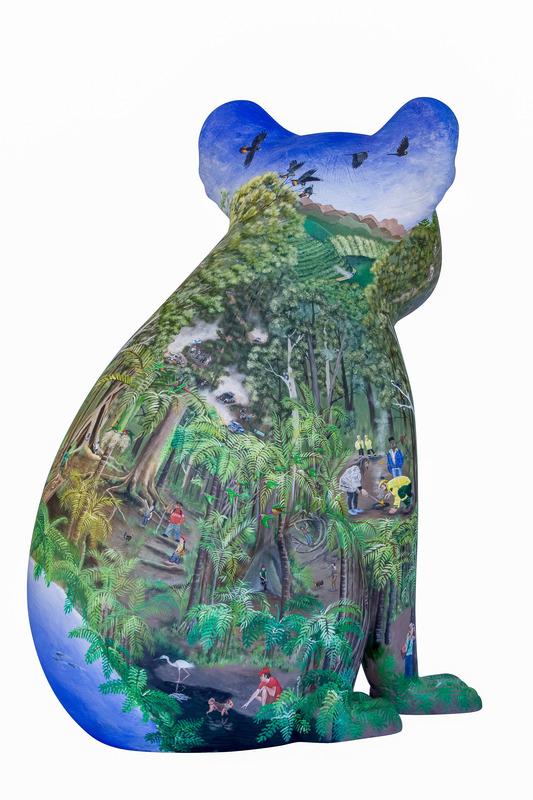 Pauline’s original artworks are created to awaken the viewer’s imagination and stimulate their senses. 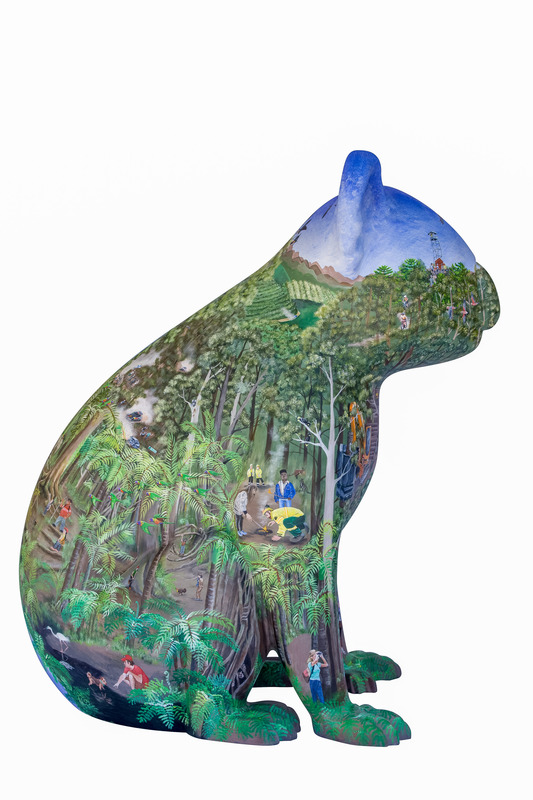 Pauline’s paintings are highly sought after and hang in private, commercial and public collections in Australia and around the world. Pauline has had 5 recent exhibitions in Italy, has numerous awards, and is a regular guest artist in various art publications. 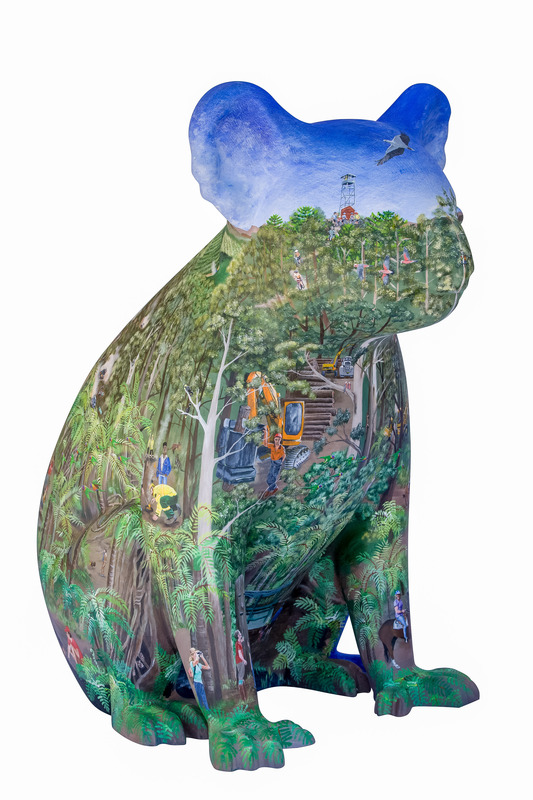 Pauline has been commissioned to paint 8 Hello Koalas Sculptures.